Fixed behavior with source files that have Windows line-endings or missing line-endings. With a nice self-referential touch, the notes reveal the very problem they are describing. On Windows, a line ending is usually encoded by two characters (carriage return and line feed), whereas on Unix (and similar systems like Linux and Mac OS 10) a single line feed character is used. Notepad is the default viewer for text files on Windows, and displays these Google release notes with scrambled formatting. A programmer’s editor like CodeWright1 understands both conventions and the file displays fine. It is a minor annoyance, but exposes a deeper problem. There are two factors at play here. One is that the open source world has tended to use Unix-like operating systems (maybe because open source operating systems are Unix-like); the other is that the favourite client OS among Web 2.0 geeks is the Mac. It’s likely therefore that most or all the folk working on App Engine do not use Windows and do not see this issue. They have taken the trouble to support Windows, but the Windows platform is just a little alien. The poor experience you get when double-clicking a readme is a symptom. What was that default again? There is no /tmp directory on Windows. I am sure the script uses a sensible default on Windows; but it will be different from what these notes say. Let me add that the Unix directory structure is generally nicer to work with than Windows, with its archaic drive letters; and that I see little sense in the carriage return character being needed to end a line (it’s a throwback to the typewriter). Windows is also more wrong that right about using the backslash as a path divider (all IBM’s fault, apparently). As a developer, I perceive these things as a small nudge that I might not be using the best OS for the task in hand. That’s unfortunate for Microsoft, and I’m not sure how it can fix it – though getting Notepad to respect Unix line endings would be a start. 1CodeWright is/was an excellent editor that was acquired and killed by Borland; unfortunately it does not work properly on Vista though I still find it handy occasionally. IronRuby dispatched some simple requests through an unmodified copy of Rails a few days ago. Today, we’re going to show off our progress live at RailsConf. He adds that performance is terrible; so you might not want to migrate your project just yet. Why bother? Mainly, to get Rails productivity plus access to .NET libraries – in other words, integration with Microsoft’s platform. Microsoft has revised its document describing Five Misunderstood features in Windows Vista. Those changes were made because the original article was written without the involvement of the engineering teams and so it contained a great deal of inaccuracy. The trouble is, even fixing inaccuracies doesn’t rescue the document from its faulty presumption that Vista’s poor public image is all down to misunderstandings. That ain’t straight talking. That’s spin. Proof that Google is God. Don’t forget Asimov was here first – remember Multivac? Google Gears support in WordPress – is this the road to plug-in hell? The patch adds all static files used in the admin interface to a single offline storage. That speeds up page loading a lot, as it serves virtually all requests for static files from the computer’s HD instead of the network. So instead of 50-60 requests to the server on some pages, there are only 2-3. Very simple, very effective. A user blogs the experience here. So is Gears taking off? Maybe. There’s Zoho; there’s Google itself, there’s MySpace, which uses Gears for searching and sorting messages. Note that Gears is still in beta; it’s curious that major sites are willing to use it in that state, but that’s the Internet for you. I have reservations about Gears. There’s the security angle. More seriously, there’s the question about whether this is the right way to extend the browser. Google is doing its own thing; so is Yahoo with BrowserPlus; so is Adobe with Flash, and Microsoft with Silverlight. All of them swear that they love browser standards, and in some cases (like local storage) there may be consolidation towards a standard API – see here for a good discussion – but there is real danger of plug-in hell. Security is bound to be an issue as well, since the more browsers and their plug-ins interact with the client (which is the purpose of these extensions), the more potential there is for compromising the client. I will soon be jumping back into the Microsoft maelstrom, this time in the Visual Studio / Developer Division (devdiv) team. I will again be telecommuting from Santa Cruz. I’ll be part of a new incubation team composed of Chuck and a few other legendary devdiv veterans (I’m not sure I can say who yet) working on stuff to make accessing Windows Live services easier for developers. I have had great respect for Thorpe ever since reading his book on Delphi Component Design, which despite its age is still a good read if you want to know how the Visual Component Library in Delphi hangs together. His career has been a bit butterfly of late – from Delphi to Google to work on Gears, then Microsoft developing Live Services, then working on browser plugins at cooliris (makers of PicLens); and now back to Microsoft. If Microsoft is to bring its Live Services into wide use, strong Visual Studio integration is a must; I guess this may be what his new role is all about. Once you’ve defined Subversion as your version control system, you can update your site to get the latest versions of its pages directly from within Dreamweaver; no third-party utility or command-line interface is required. Fireworks has greater scope, supporting CSS, and allowing export to HTML with CSS, PDF or AIR. Now includes Adobe Type Engine. Adobe has also been polishing its “universal user interface” across its product range. The beta is for Mac and Windows, and is intended for existing CS3 users; others will find the beta timing out after 48 hours. Microsoft wants to end the Windows release circus? Microsoft’s goal looking forward is to focus on building Optimized Desktop infrastructures including an OS versus single point-in-time OS releases. That sounds sensible. It also suggests that Microsoft is beginning to treat its client OS as mature, at least when it comes to the kernel and core. The problem with big OS releases, as we saw with Vista, is getting the drivers lined up and working properly. Treating OS upgrades more casually is fine as long as the drivers continue to work. Windows 7 will ship around January 2010. Actually, the release says “approximately three years after the general availability of Windows Vista (January 30, 2007)”. Of course January is a terrible month to release a new OS; Vista ended up there by mistake. More likely is September 2009 (optimistic) or say June 2010 (realistic). Windows 7 will be available in both 32 and 64-bit. The goal with Windows 7 is that it will run on the same hardware as Windows Vista and that the applications and devices that work with Windows Vista will also be compatible with Windows 7. Microsoft’s Professional Developer’s Conference is traditionally where it shows developers its forward plans. Sometimes these do not work out as expected. Notorious examples include Hailstorm web services, and pre-reset Vista, in which Windows Presentation Foundation was more at the core, and which included the WinFS smart file system. 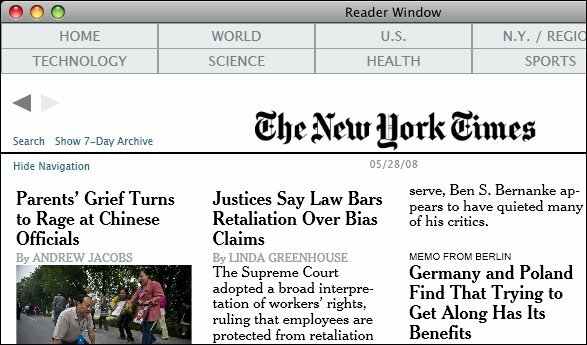 The New York Times has run into a hail of criticism from Mac users over its use of Microsoft’s Silverlight plug-in for its offline reader, Times Reader, in its new Mac version, now in beta. Nope. Not going to use *anything* from Microsoft. If reading the NYT requires MS products then, for this reader, goodbye NYT. Silverlight? Why? I’m using Mac to escape Microsft’s crappy technology. PLEASE listen to your readers. Macs have a long, successful history of superior page layout, design, and rendering of published content. There is absolutely no reason to require a Microsoft plugin to display text and graphics on a Mac. 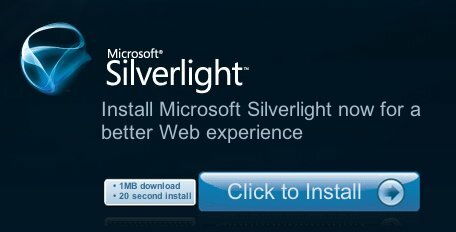 Silverlight will not install on Firefox on an Intel Mac (all versions current.) Why, O, why did you choose to go with a proprietary Microsoft technology with all the predictable Microsoft flaws and prejudices? I was really looking forward to this, but I cannot support Microsoft’s Silverlight platform. Not only is it proprietary, but it runs more slowly than any alternative (Java, Flash) and it does not support end-user choice of browsers (Firefox, Safari not supported). Sometimes I find it hard to admit I’m a mac user. What a community of loud close-minded drama queens. “I’m canceling my subscription because you built an app that requires silverlight.” Please. Installation was quick, and at the end invited me to restart the browser – though it seemed to do so automatically. Microsoft’s web page now informed me that Silverlight was installed and showed an animation. The application worked well in my brief test. The most obvious difference from the Windows version is that there are four fixed window sizes, rather than on-the-fly reflowing of text. It will be interesting to see if the more advanced Silverlight 2.0 can come closer to the full WPF (Windows Presentation Foundation) version; if it can, there would be a good case for implementing both versions in Silverlight. It is an interesting project, since it runs Silverlight within a desktop application, rather in the manner of Adobe’s AIR. Maybe Flash would have been as good or better, though as I understand it the New York Times finds XAML, the layout language in Silverlight, an excellent fit for what it wants to achieve. Nevertheless, my experience suggests that blanket hostility to Silverlight on the Mac is hard to justify from a technical perspective. In fact, Microsoft has done a good job in respect of keeping the download size small and making installation smooth. Admin rights were requested, but no restart was needed. Still, if Silverlight attracts so much bile from readers of the NY Times it suggests Microsoft has a considerable problem on its hands. I’d imagine it is off-putting to others who are considering the development of Silverlight apps, since Mac support is a critically important feature.